Memphis, Tennessee, was named after Memphis, Egypt. Memphis was the ancient capital of Aneb-Hetch, the first nome of Lower Egypt. Its ruins are located near the town of Mit Rahina, 20 km (12 mi) south of Giza. Memphis is closely associated with the ancient Egypt's capital city site, 25 km south of Cairo. 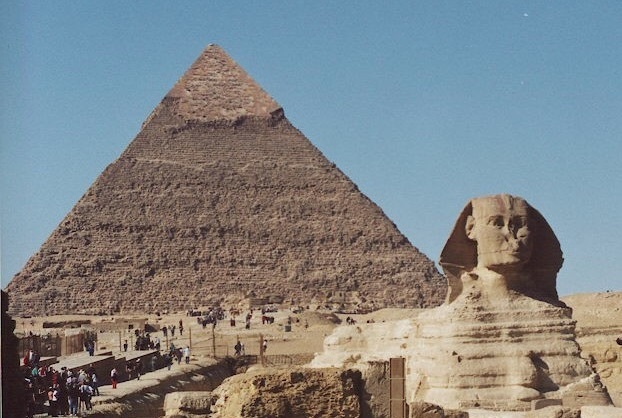 This is where the cemeteries, or necropolises, of Memphis, and the famous pyramids of Egypt and the Great Sphinx are located. 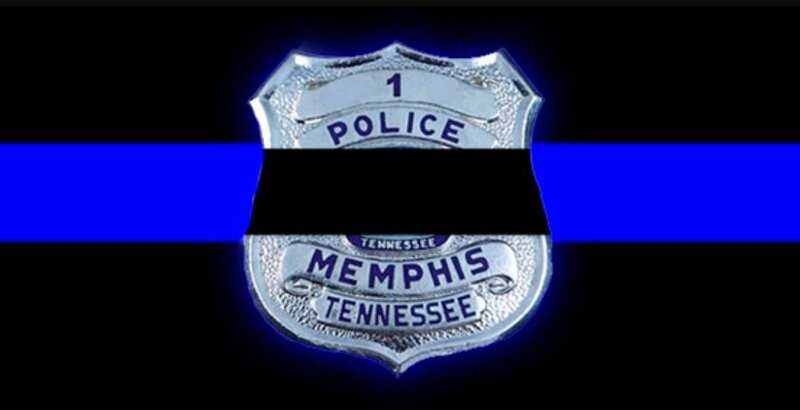 Memphis, Tennessee, was the focus of a shooting spree on 6.4.2016. The outcome was the death of a policeman. 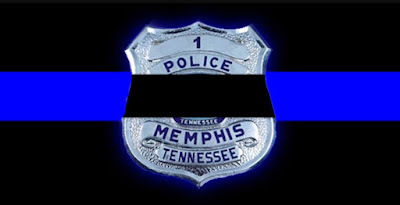 An 18-year veteran of the Memphis Police Department died Saturday night, [June 4, 2016,] after being struck downtown by the vehicle of a fleeing shooting suspect. Verdell Smith, 46, died at the Regional Medical Center at Memphis....no charges have been filed yet against the suspect who felled Smith, who left a father, fiance and children. Smith was struck after the unidentified suspect, who was taken into custody and transported to the Regional Medical Center in noncritical condition, shot three people during a spree that began in the Pinch District at Westy's Restaurant and Bar and spilled over to Bass Pro Shops before ending near Beale and Third streets. ...Police at Main and Exchange heard shots at 9:55 p.m. and found two male victims at Westy's. They were transported to Regional Medical Center and remained in critical condition. At 10:02 p.m.,...police got a call to the nearby Bass Pro, where a male employee had been shot. He was taken to Regional Medical Center in noncritical condition. The suspect fled in a silver vehicle and was spotted on Riverside Drive before officers lost sight near the interstate. ...Police weren't sure what route the suspect took next, but he ended up at Beale and Third as officers were working to clear the area. That's where Smith was struck. The suspect was taken into custody after a foot chase. 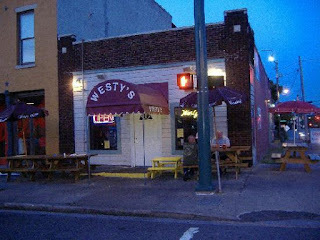 Martin Norris and Jake Schorr IV, employees of Westy’s, said a man walked up from the south on Main Street, talking loudly to himself, pulled a handgun and shot two customers who were sitting at a picnic table in front of the restaurant. Norris and Schorr chased the man down the block, but he crossed Front Street and jumped a fence, heading toward the parking lot of Bass Pro Shops at the Pyramid. There, truck driver Luis Cortez of Laredo, Texas, was exiting Bass Pro with his family when he heard gunshots in the parking lot. Cortez said the victim appeared to be a store employee who had been collecting shopping carts. Cortez said he saw a car near the victim, but couldn’t see inside it because of dark-tinted windows. The car sped away and the victim ran to the store entrance, Cortez said. Memphis resident Tina Jamison said she was on Beale when the crash occurred, and she approached officers on the street. "We heard on the scanner, 'officer down,'" Jamison said. She said when she heard commotion, she initially thought there had been a fight on Beale. "They told us to go inside one of the restaurants," she said. ~ Commercial Appeal. 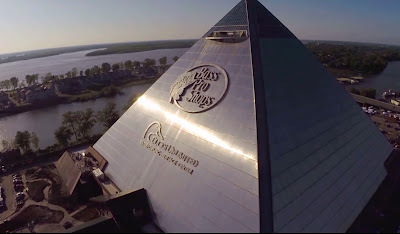 In 2015, Bass Pro Shops opened its very own monument. 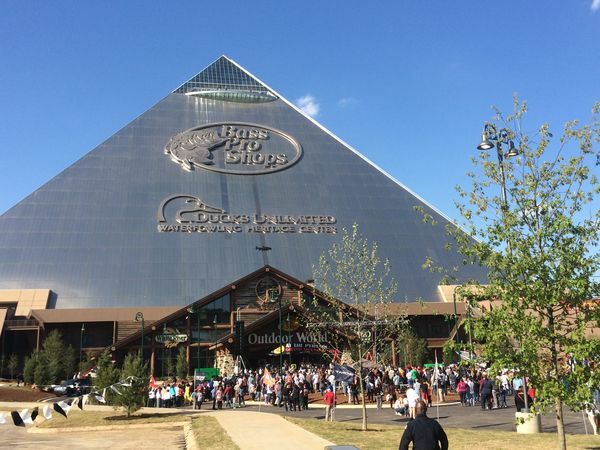 At 32 stories tall, this superstore is the sixth largest pyramid in the world. June 4, 1862 – American Civil War: Confederate troops evacuate Fort Pillow on the Mississippi River, leaving the way clear for Union troops to take Memphis, Tennessee. Beale Street! Beale, isn't that one of the syncronistic, infamous names that keep reappearing in news and history that you've mentioned a few times? What's with the pyramid? When I think of outdoors, hunting & fishing, the last thing I think of is an Egyptian pyramid! Roadside attraction or something more initiatory? "Beale Street! Beale, isn't that one of the [synchromystic], infamous names that keep reappearing in news and history that you've mentioned a few times?" Yes, it is, as a version of “Bell.” Recall, in Jim Brandon's 1983 book, The Rebirth of Pan: Hidden Faces of the American Earth Spirit, he mentions "names like Bell, Beall and variants.” One of those would be “Beale." I specifically noted "Howard Beale," the TV news anchorman who rallies the nation to shout “I’m as mad as hell, and I’m not going to take this anymore!” in Network (1976). Also, "A New Day" wonders, "What's with the pyramid? When I think of outdoors, hunting & fishing, the last thing I think of is an Egyptian pyramid! Roadside attraction or something more initiatory?" 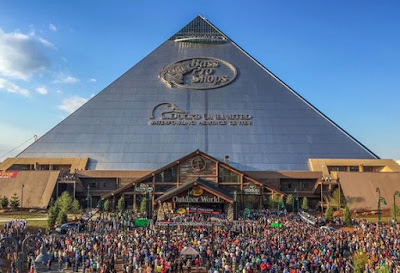 The pyramid has everything to do with the link that the original named Memphis has to Egypt. Weird. Memphis has been on my mind a bit lately. Just yesterday I was telling a friend I spent my 10th birthday at Mud Island in Memphis. 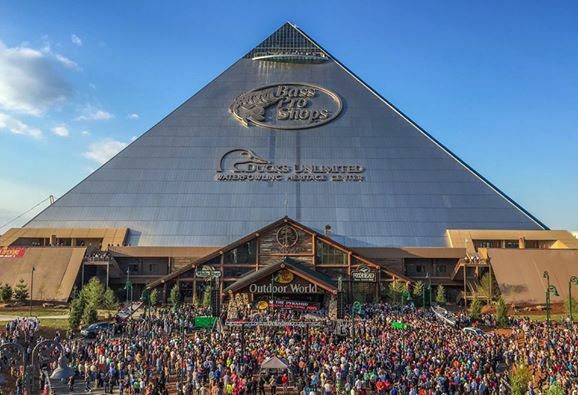 Anyway, four years ago I wrote a piece about the Pyramid in Memphis, Tenn., and its weird origins.